’Tis the season to shop! Do those five words fill you with delight or dread? Holiday shopping can be one of those overwhelming tasks that puts a damper on the whole season. But it doesn’t have to be stressful. The next time you’re in the salon for a relaxing service, stop by the retail section—you’ll be surprised how many people you can knock off your list in one easy shopping experience. We’ve created a guide to some of our favorite holiday gifts from Aveda, tailored to all the people in your life. Need a personal shopper? Ask your stylist for a little professional guidance—you’re in good hands. Ah, the stockings. So much fun to open, but soooo tedious if you’re the one filling them! Never fear, these four travel-size products are perfect for the cold winter months, and are great for both men and women. Hand Relief Moisturizing Crème: Relieve dry skin throughout the winter with a tube of this stashed in your desk, purse or car. Travel-Size Air Control Hair Spray: Dry, winter air wreaking havoc on your hair? Tame flyaway, static-y strands anytime, anywhere, with this little bottle of magic. Lip Saver: A soothing, moisturizing balm for dry lips, with cinnamon leaf, clove and anise oils, will be received with delight! 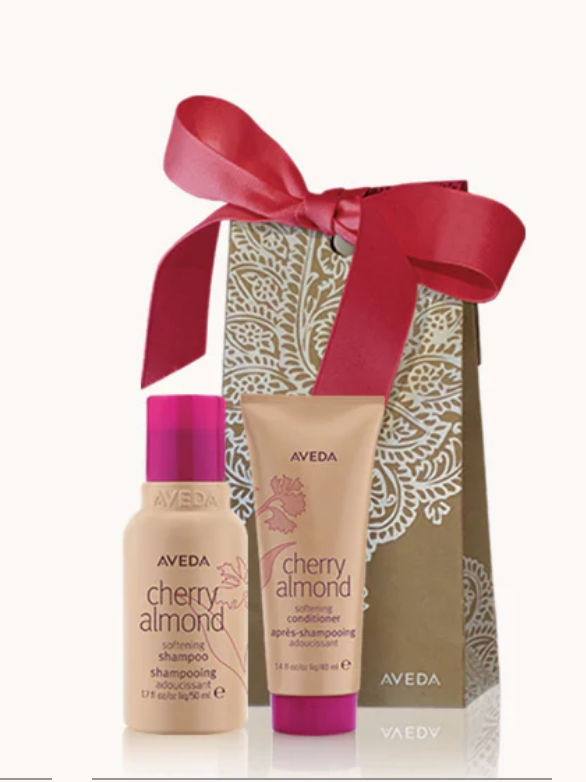 Cherry Almond Gift Set: This travel-sized shampoo/conditioner duo softens hair with the most amazing scent! There’s always at least one person on your list who deserves a little extra love during the holidays. Maybe it’s your mom, your spouse or your best friend. And maybe that person is also the one who is the toughest to buy for every year. Never fear, the gift of relaxation and beauty is ALWAYS welcome! Try one of these gifts for extra “wow” factor this season. A Spa Experience: Mix and match spa services to create the ultimate gift. Choose from an array of massages, body treatments, facials, mani/pedis…the possibilities are endless. Tulasāra Skin Care Products: Want to really spoil mom? Or treat your bestie to a skin care splurge? Aveda’s Tulasāra line of high-end skin care delivers results with natural ingredients. Not sure where to start? The Tulasāra Wedding Masque and Wedding Masque Eye are fan favorites. Litres of Shampoo/Conditioner: Who doesn’t want litres of their favorite shampoo/conditioner sitting pretty on the shower shelf? Stock your loved one up with their favorite Aveda shampoo/conditioner set—supersized! Relax the Body: Knock her socks off with this duo: Beautifying Radiance Polish, a renewing and moisturizing body scrub and Stress-Fix Soaking Salts, mineral-rich bath salts with a relaxing aroma. Step away from the sporting goods store and into the salon to buy something special for the man in your life. He may not always splurge on these items himself, but once he tries them, he’ll be hooked! Book a Massage: Men need self-care, too! Brighten up his holiday with a massage or series of massages. Travel Kit: Does your guy spend a lot of time on the road? 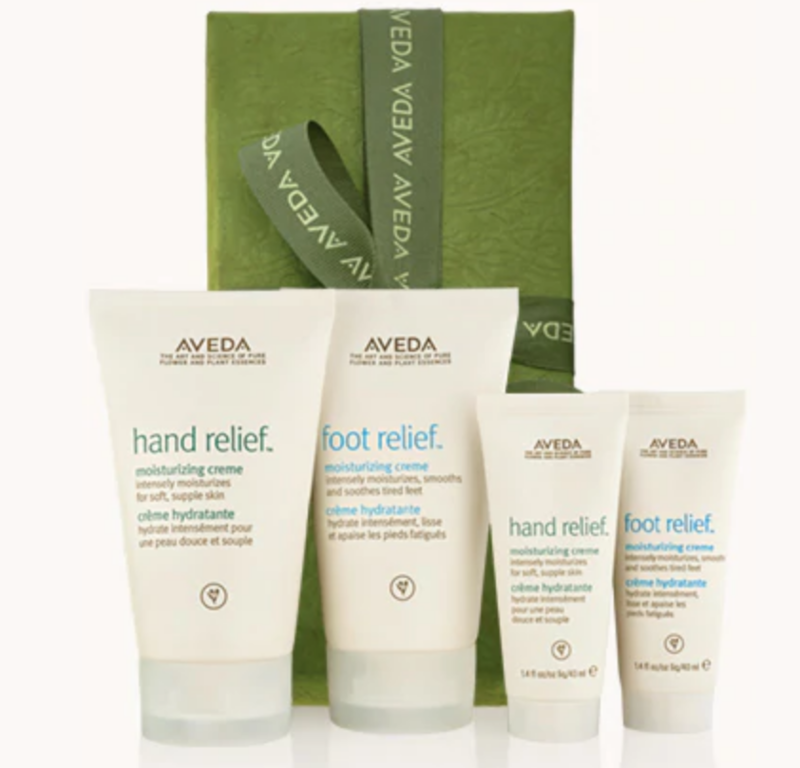 Tailor a travel kit to him with travel-sized Aveda shampoo, conditioner, lotion, breath freshener and more. Luxury Shave: Aveda Men Pure-Formance Shave Cream, Aftershave & Aroma Spray: Make him feel like he’s spending the morning at the spa every time he shaves with these moisturizing shave products. Expensive electronics may top their wish list, but beauty products are a close second (and a little more budget-friendly). Get your teen into a healthy beauty routine with these natural products and watch them glow. Aveda Makeup: From lips to eyes, Aveda has your teen covered with products made with natural ingredients. The Petal Essence Eye Trio comes in a wide range of fun, flattering shades. Or let her tap into her natural glow with Uruku Bronzer. Ask our makeup expert for help in choosing just the right items and shades for your teen. Flax Sticks Daily Effects Brush Set: Upgrade her tools with this luxury professional makeup brush set. Outer Peace: Soothe breakouts with the botanicals in the Outer Peace line. The Foaming Cleanser and Acne Relief Pads will be welcomed gifts. Does December feel like one endless loop of holiday get-togethers? Stock your cupboard with these fantastic hostess gifts and you’ll worry about one less thing. After dozens of bottles of wine and trays of cookies, your hostess will be thrilled with one of these thoughtful gifts. 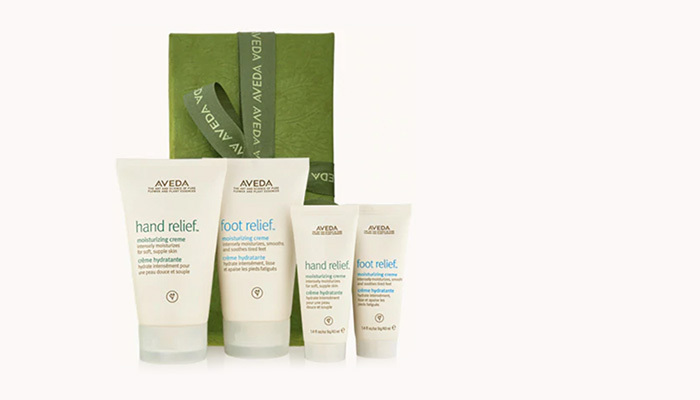 Hand Relief and Foot Relief Gift Set: Drench dry skin in luxurious moisture all winter long. Candrima Candle: Light up the holidays with the festive scent of ginger in this clean-burning, limited-edition soy wax candle. Aveda Comforting Tea: This soothing herbal tea is infused with licorice root and peppermint for a slightly sweet, totally unique flavor. Pack it up with some pretty mugs for the perfect gift. Sometimes you need to slow down and give yourself both a moment to breathe, and a small indulgence, as you run from one activity to the next. These Aveda products will keep you looking and feeling your best through parties, programs and more. 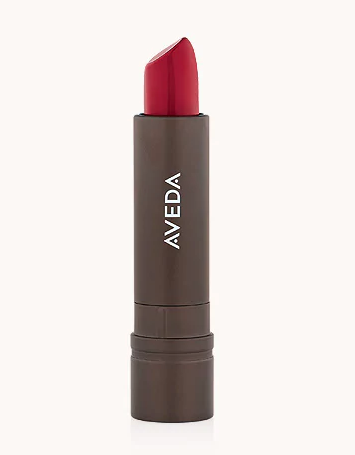 Feed My Lips Lipstick in Vibrant Red: Give yourself a pop of color with this bold red. Perfect for the holidays, this shade features a long-wearing formula with natural ingredients. Peppymint: Feel like a New Year’s Eve kiss is imminent? Discreetly freshen your breath with these drops of natural peppermint and anise. Shampure Dry Shampoo: Save time in the morning by using this strand-reviving dry shampoo. Your lackluster locks will thank you. Gifts of beauty last all winter long. If you’re still not sure which Aveda product or service would be perfect for your loved one, talk to your stylist or one of our retail specialists. We can direct you to the perfect gift for everyone on your list.